This ground is rather let down by the East stand, and would arguably be one of the best grounds in Scottish football, if this was improved. 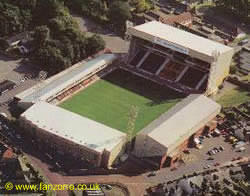 Unfortunately it is not quite as grand as Tynecastle, Tannadice, and is streets behind the Old Firms' stadia. This ground has a rather muddled appearance, and has been described as the 'Dr Jekyll and Mr Hyde' of football grounds. The reason for this is that the atmosphere, and facilities vary depending on where you sit. It should be said, that the ground is reasonably modern, and quite impressive. If you are a registered user then you can login, and create your own personal review of Motherwell Football Club - Fir Park. These reviews can be private or public.